This stir fry dish is both nutritious and tasty. We usually serve it on top of a bed of steamed brown rice. This recipe makes 4 servings. Cut the chicken crosswise into 1/2″ wide strips. In a large skillet, heat 2 Tablespoons of oil over medium heat. Cook the chicken for about 4 minutes (or until done), stirring occasionally. Using slotted spoon, transfer chicken to a warm bowl. In the same skillet, heat the remaining oil. Add the red pepper and broccoli (and onion if using sliced). Cook for about 2 minutes. Stir in the stock and reduce heat to low; cover and steam for two minutes. Using slotted spoon, add the vegetables to the bowl of chicken. Cover to keep warm. Pour the vinegar into the same skillet and bring to a boil while scraping up the brown bits in the pan. Stir in the mustard, tarragon, salt and pepper. Add in the mushrooms and chopped green onions. Return chicken and vegetables along with any accumulated juices to the skillet. Heat through. Serve on a bed of steamed rice. This recipe was taken from a mini specialty cookbook that was put out by Canadian Living. The book was a freebee I got way back when I was in university with the purchase of a tank of gas and is called Easy Chicken Dishes. 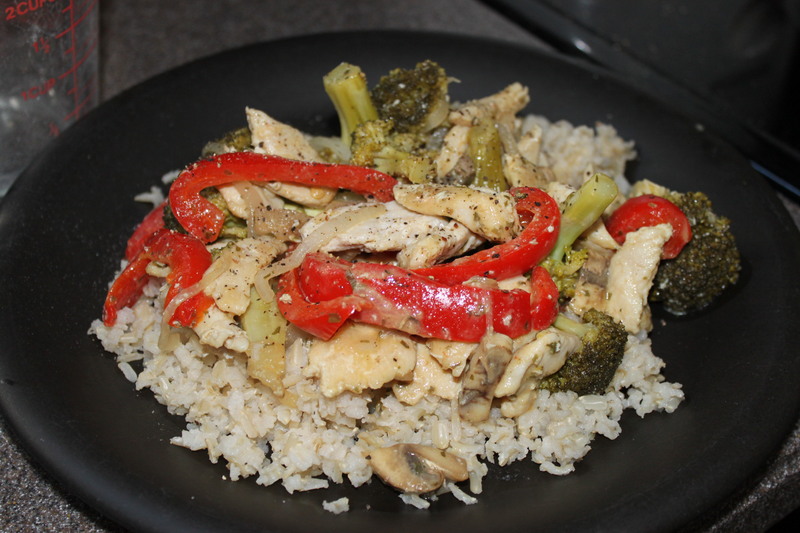 Posted on May 16, 2014 by Cindy Roy •	This entry was posted in Main Course, Recipes and tagged chicken and broccoli, chicken recipes, chicken stir fry, healthy dinners, skillet chicken salad. Bookmark the permalink. So we did have it for dinner tonight, and it was absolutely delicious. We both really enjoyed it. Thank you for this. Glad you liked it. I find the flavour is great and heats up well as leftovers too!